The Facts Tab is located to the upper right of the 'Document Viewer'. To open the 'Facts Tab' click on any link to the document in Lexbe eDiscovery Platform, such as from the 'Search', 'Browse' or 'Facts & Issues' pages. 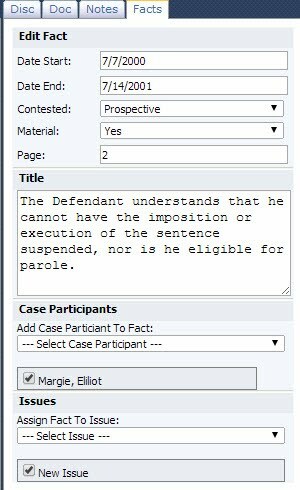 Lexbe eDiscovery Platform allows you to add and edit Facts for a particular document. After clicking on this coded data tab, all the facts related to the document selected will be displayed. Date Start: It can the date the selected document was produced or a specific date in the document itself. Date End: It refers to the Timeline View generated under the Analysis>Facts & Issues tab. Contested: If the fact is contested or not (optional). Material: The 'Material' field allows you to indicate if a fact is material, not material, or undecided. Page: It refers to current document page shown in the Document Viewer, this field is very helpful when you open a PDF Document with multiple pages. It will also show the page count to Lexbe Facts. For example, we have opened in the Document Viewer a document with 10 pages. We also created a new fact including a 'Date Star: March 17, 2004', 'Title:Final Invoice for Billing' and in the 'Page field:4', referring to the page of the Invoice. Case Participants: Associate the litigants, deponents, witnesses, and other individuals and organizations to the 'New Fact'. Issues: The fact will be assign to 'Issues' categorized under the case. When you are done making changes to the Facts in the required fields, just click on 'Save' or 'Cancel' button. When editing a Fact, you will not have the ability to specify a year or day only in the timeline because a date is estimated (mm/dd/yy).